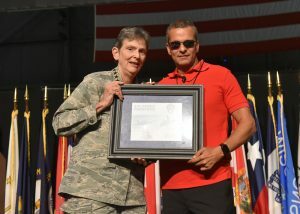 Held at the majestic National Museum of the United States Air Force in the Modern Flight hangar. 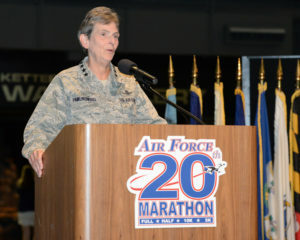 Wright-Patterson Air Force Base’s own chef will prepare pastas, salads, a variety of fruits and desserts for participants to load up on carbs the day before the big race. The Gourmet Pasta Dinner is buffet style. This special evening will include speeches at 6:00 p.m. from Air Force senior leadership and a special guest, to be determined. Additionally, there will be performances by the Air Force Band of Flight. Cost is $26 per adult, $13 per child ages 6-10, and children 5 and under eat free, although we do need to have them registered in our system. Gourmet Pasta Dinner tickets can be purchased through the Registration page. When registering, participants may select the desired number of tickets and the price will be added to their order. Tickets will be available for pick-up at the Sports and Fitness Expo. 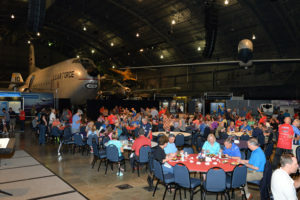 As a special treat, dinner guests may tour the National Museum of the United States Air Force. Knowledgeable museum volunteers will be on hand to answer your questions from 5:30 to 8:30 p.m.